After more than a year of acrimony and unofficial sanctions against South Korean firms, China appears to be writing off its long-standing opposition to the deployment of an advanced U.S. missile defense system in South Korea. On Tuesday, however, Beijing and Seoul agreed to enter a détente of sorts and work toward restoring their bilateral ties. The decision, the result of long-running bilateral diplomacy since left-leaning South Korean President Moon Jae-in was elected in May, comes at a time of heightened tensions in the region after a multiple North Korean ballistic missile tests and a presumed thermonuclear bomb test in September. The first step in restoring better ties between the two countries will be a leader-level summit, bringing Chinese President Xi Jinping together with Moon on the sidelines of the Asia-Pacific Economic Cooperation (APEC) meeting in Da Nang, Vietnam, on November 10 and 11. “The two sides attach great importance to the Korea-China relationship,” South Korea’s foreign ministry said in a statement. “Both sides shared the view that the strengthening of exchange and cooperation between Korea and China serves their common interests and agreed to expeditiously bring exchange and cooperation in all areas back on a normal development track,” the statement added. The Chinese side released its own statement coordinated with the South Korean side, noting that the two countries were working to restore their relationship as soon as possible. Beijing, meanwhile, hasn’t changed its tune on THAAD entirely. “China’s position on the THAAD issue is clear, consistent, and has not changed,” Chinese Foreign Ministry spokeswoman Hua Chunying clarified for reporters at a briefing. Rather, Beijing appears to have calculated that the costs of a frozen bilateral relationship with South Korea are no longer worth bearing. In the meantime, the two sides will convene talks on “THAAD-related issues,” according to the South Korean side. Since THAAD is operated by the United States in South Korea, it’s unclear what role Washington might play in these talks. The Obama administration, in 2016, had invited China to technical talks over the THAAD system to assuage its concerns. Beijing rejected that invitation. For South Korea, however, the standoff over THAAD has had real costs. Beginning late last year, the Chinese government began unofficially retaliating against South Korean businesses operating in China. For example, South Korea’s Lottle Group, the firm that agreed to a land swap with the government to allow for the deployment of the THAAD launchers and radar, faced particular scrutiny in China. Chinese authorities even began scrutinizing cultural imports from South Korea, including pop music. Moreover, a steep drop in Chinese tourists to South Korea resulted in considerable lost revenue for the South Korean economy. It remains to be seen to what extent Xi will be willing to set aside the THAAD issue or if Beijing will offer Seoul a clear quid pro quo over the system’s deployment. Already, South Korean Foreign Minister Kang Kyung-wha has provided assurances to China that Seoul is not intending to join any networked East Asian missile defense program that the United States may set up to counter China. With China tolerating systems in place today in exchange for such a guarantee from South Korea, Beijing may see itself the winner in this situation. 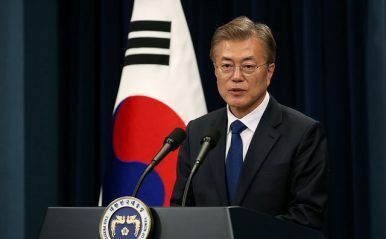 Moon, before he became a candidate for the presidency after Park’s impeachment, was himself critical of the system’s deployment. Over the summer, his administration temporarily froze the deployment of four out of the six THAAD launchers pending an environmental assessment. Still, with the North Korean threat at a new level this year, an improvement in the South Korea-China relationship could prove beneficial in the region. However, expectations should be tempered. Historically, Seoul — like Washington — has not been successfully in getting China to fundamentally reassess its interests on the peninsula regarding North Korea. It’s unlikely to succeed this time around, but even without any breakthroughs on North Korea, the economic benefits to South Korea alone may end up worthwhile.